Understand the relationship between the students, the subject matter, themselves, and teaching practices that positively influence and sustain student learning. Reflectively examine and expand their teaching approaches to increast student engagement in deeper learning and increased responsibility. Learn effective ways of teaching to enhance overall student success by employing a wide variety of practical examples, strategies, and pedagogies. This chapter illustrates the changes in today’s educational landscape with a focus on the challenges posed by today’s diverse students. This chapter presents the rationale for why teaching matters, highlighting characteristics of community college faculty and students. The feedback from 200 students is presented, along with relevant studies on what students say about teachers who help them learn. This chapter presents the insights from 100 engaged teachers, demonstrating how they understand and help students create learning connections. The active learning practices that the exemplary teachers in the study use to engage students in the subject are presented in this chapter. This chapter illustrates the insights and reflective practices of exemplary teachers through classroom and self-appraisal strategies. This chapter presents 50 of the best ideas and strategies for engaged teaching and learning captured in this study. This chapter presents 25 ideas for engaged teaching and learning with a focus on collegiality and community. 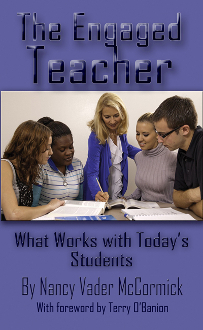 A conclusion of the “best” teaching practices based on the study is presented in this chapter. Nancy Vader-McCormick, PhD, is a scholar, educator, and consultant with over 25 years as an award-winning and innovative teacher. She is a Professor of Communication and the Coordinator of the Faculty Center for Teaching Excellence at Delta College in Michigan. Nancy earned her doctorate at the University of Florida, two MA degrees at Central Michigan University, and a BS fro Western Michigan University. Her publications include Academic Service-Learning: A Handbook for Faculty and Creativity: From the Inside Out.